BOSTON, MA, September 12, 2017 – Vertical Systems Group’s Mid-Year 2017 Global Provider Ethernet LEADERBOARD results are as follows (in rank order based on retail port share): Orange Business Services (France), Colt (U.K.), AT&T (U.S.), Level 3 (U.S.), BT Global Services (U.K.), Verizon (U.S.) and NTT (Japan). The Global Provider LEADERBOARD, the industry’s benchmark for multinational Ethernet network market presence, ranks companies that hold a 4% or higher share of billable retail ports at sites outside of their respective home countries. 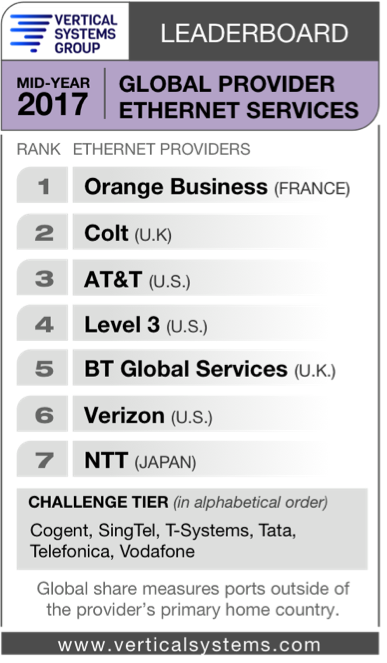 Based on mid-year 2017 port share results, Orange, Colt and AT&T continue to rank as the top three companies on the Global Provider Ethernet LEADERBOARD, respectively. Level 3 moves up to fourth from fifth position, displacing BT Global Services. The Challenge Tier of Global Providers includes companies with share between 2% and 4% of this defined market. Six companies qualify for the mid-2017 Challenge Tier (in alphabetical order): Cogent (U.S.), SingTel (Singapore), T-Systems (Germany), Tata Communications (India), Telefonica Worldwide (Spain) and Vodafone (U.K.). The Market Player tier includes all Global Providers with port share below 2%. Companies in the mid-year 2017 Market Player tier are as follows (in alphabetical order): Bell (Canada), Bezeq (Israel), CAT Telecom (Thailand), CenturyLink (U.S.), China Telecom (China), China Unicom (China), Chunghwa Telecom (Taiwan), Eir (Ireland), Embratel (Brazil), euNetworks (U.K.), Exponential-e (U.K.), Global Cloud Xchange (India), Globe (Philippines), GlobeNet (Brazil), GTT (U.S.), Hutchinson Global (Hong Kong), Indosat (Indonesia), Interoute (U.K.), KDDI (Japan), Korea Telecom (Korea), KPN (Netherlands), Liberty Global (Netherlands), Masergy (U.S.), PCCW Global (Hong Kong), PLDT Global (Philippines), Rogers (Canada), Rostelecom (Russia), Softbank Telecom (Japan), Spark (New Zealand), Sparkle (Italy), Sprint (U.S.) StarHub (Singapore), Symphony (Thailand), TDC (Denmark), Telekom Malaysia (Malaysia), Telia (Sweden), Telin (Singapore), Telkom South Africa (South Africa), TelMex (Mexico), Telstra (Australia), Vector (New Zealand), Virgin Media Business (U.K.), Zayo (U.S.), and other providers selling Ethernet services outside their home country. Detailed Ethernet share results for Global Providers plus in-depth share analysis are available now exclusively through Vertical Systems Group’s ENS (Emerging Networks Service) Research Programs. Expanded research coverage of mid-year 2017 market share results includes Port Share Analysis, Service Provider Profiles and MEF Certification status of top providers.